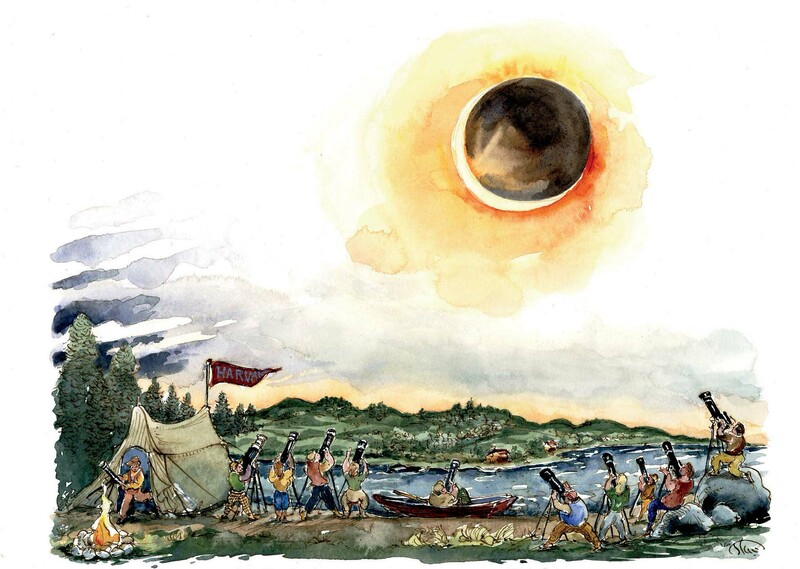 Guided by meteorologists’ advice to find a spot in the lee of a large lake—to avoid the cumulus clouds typical of New England August afternoons—the 17-member Harvard Eclipse Expedition sets up camp east of Lake Sebago, in Gray, Maine, and successfully completes its scientific studies of the August 31 total solar eclipse. The path from University Hall to Johnston Gate has been widened by the Navy to accommodate formations of marching men from the Harvard Naval Training School. The proprietors of all stores in the block slated to become Holyoke Center are invited to meet with the University’s planning coordinator and the dean of the Design School; they are assured that Harvard proposes to render every assistance possible during construction and to grant them space in the new building once it is completed. The major Harvard and Radcliffe Commencement speakers, Edwin O. Reischauer, Ph.D. ’39, and Barbara Tuchman ’33, criticize U.S. policies toward Asia in general and the Vietnam War in particular in their addresses. Among going-away gifts received by retiring Radcliffe president Mary Bunting is a specially bred purple cow (the product of a Charolais-Holstein cross) for her New Hampshire farm. On the twenty-fifth anniversary of the announcement of the Marshall Plan, West German chancellor Willy Brandt, LL.D. ’63, announces the creation of the German Marshall Fund in a speech at Sanders Theatre. The new fund will underwrite academic and scientific programs to stimulate American involvement in European questions and to promote mutual cooperation. Harvard agrees to participate in the “Scholars at Risk Network,” which offers temporary positions to scholars threatened in their homelands; the University will host researchers from Iran and Ethiopia in the new academic year.